A quick and easy recipe for a seasonal Japanese dessert. You can enjoy the combination of excellent Japanese Strawberries and read bean paste. ① Remove the strawberry stems, rinse the strawberries in water, and then pat dry with a paper towel, etc. ② Divide the red bean paste into 10 equal portions on a cutting board or plate. Spread each into a circular shape about the size of your palm. Place a strawberry in the middle of each. Enclose each strawberry in the red bean paste and set all aside. ③ Thinly spread some of the katakuri flour onto a baking sheet. ④ To a pot, add the rice flour, cane sugar, and water. Stir vigorously until all the lumps are gone. ⑤ Place the pot on a burner and continue to mix over low heat. Keep mixing, or kneading, until you get a translucent dough with some stretch to it. Transfer the dough to the baking sheet. Dust the whole surface of the dough with katakuri flour. Use a knife to divide the dough into 10 equal pieces. 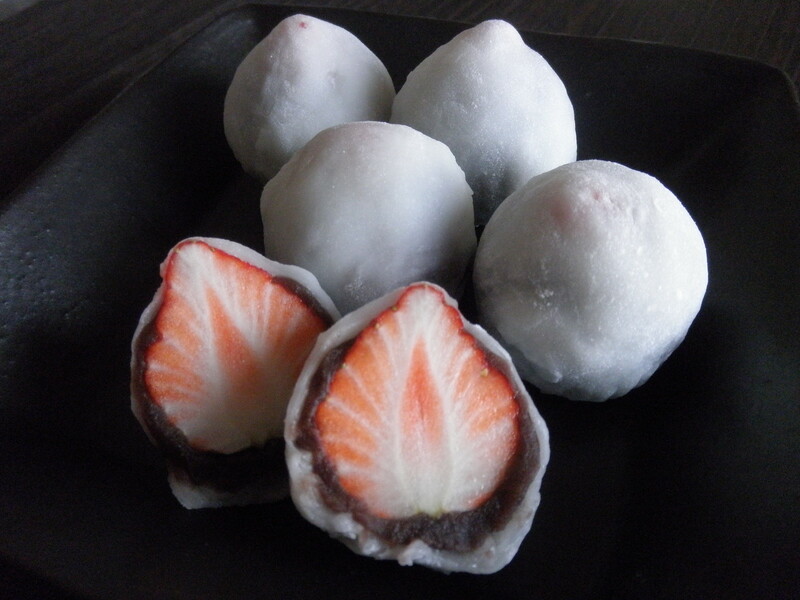 ⑥ While the dough is warm, wrap it around the strawberries enclosed in red bean paste.